■ Middle Pressure Type. Pattern width 300mm. ◆Designed for superior finish performance and reduce overspray. ◆For gun body and easy to clean surface. ◆Built for ergonomic comfort, maximum efficiency, regulatory compliance and environmental responsibility. 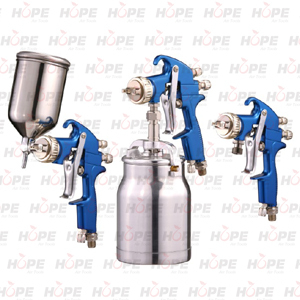 ◆Stainless steel nozzle, needle and the parts that fluid pass through. It can handle all types of solvent based coating and water based materials. ◆High performance is coupled with a gun body light in weight and designed for operator comfort to increase productivity. ◆Both suction type and gravity type for your choose.